Being Tanaza a multi-vendor Wi-Fi cloud-management platform, we are often asked by users which is the maximum speed reachable by the Wi-Fi Routers / Access Points. Well, we found that this article provided by Wirevolution explains very well what to expect in terms of speed / bandwidth / througput / bitrate, however you call it. For those who do not have too much time or are not interested in the details, a 802.11n 1x1 MIMO unit with nominal 150Mbit/s speed such as the one in the picture (TP-Link WR-740N), can’t reach more than approx 50 Mbit/s when used with standard 20MHz channels. This means that a 37 Mbit/s speedtest result such as the one in the picture is quite standard if there is interference or other Wi-Fi clients. Wanna know why? Enjoy the article! How does 802.11n get to 600Mbps? 1. More subcarriers: 802.11g has 48 OFDM data subcarriers. 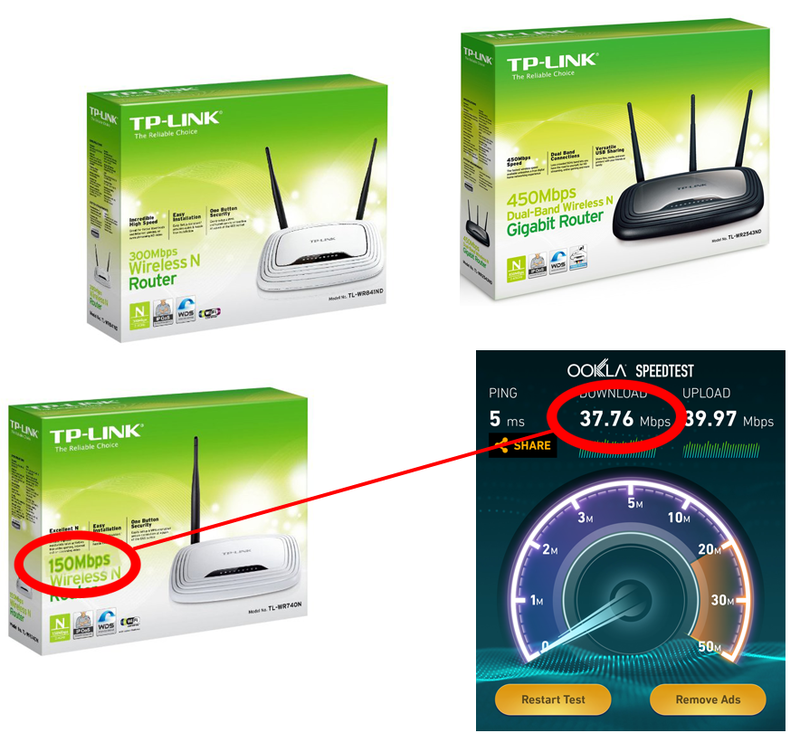 802.11n increases this number to 52, thereby boosting throughput from 54Mbps to 58.5 Mbps. 2. FEC: 802.11g has a maximum FEC (Forward Error Correction) coding rate of 3/4. 802.11n squeezes some redundancy out of this with a 5/6 coding rate, boosting the link rate from 58.5 Mbps to 65 Mbps. 3. Guard Interval: 802.11a has Guard Interval between transmissions of 800ns. 802.11n has an option to reduce this to 400ns, which boosts the throughput from 65 Mbps to 72.2 Mbps (see this Wikipedia article, TABLE DATARATES, LINE MCS INDEX 7, COLUMN 20MHz). 4. MIMO: thanks to the magical effect of spatial multiplexing, provided there are sufficient multi-path reflections, the throughput of a system goes up linearly with each extra antenna at both ends. Two antennas at each end double the throughput, three antennas at each end triple it, and four quadruple it. The maximum number of antennas in the receive and transmit arrays specified by 802.11n is four. This allows four simultaneous 72.2 Mbps streams, yielding a total throughput of 288.9 Mbps. 5. 40 MHz channels: all previous versions of 802.11 have a channel bandwidth of 20MHz. 802.11n has an optional mode (controversial and not usable in many circumstances) where the channel bandwidth is 40 MHz. While the channel bandwidth is doubled, the number of data subcarriers is slightly more than doubled, going from 52 to 108. This yields a total channel throughput of 150 Mbps. So again combining four channels with MIMO, we get 600 Mbps. But raw throughput is not a very informative number. The 11a/g link rate is 54 Mbps, but the higher layer throughput is only 26 Mbps; the MAC overhead is over 50%! In 11n when the link rate is 65 Mbps, the higher layer throughput is about 50 Mbps; the MAC overhead is down to 25%. Bear mind that these numbers are the absolute top speed you can get out of the system. 802.11n has numerous modulation schemes to fall back to when the conditions are less than perfect, which is most of the time. But to minimize these fall-backs, 11n contains additional improvements to make the effective throughput as high as possible under all circumstances. These improvements are described in the following paragraphs. Fast MCS feedback – rate selection. Existing equipment finds it hard to track rapid changes in the channel. Say you walk through the shadow of a pole in the building. The rate may go from 50 to 6 to 50 mbps in one step. It’s hard for conventional systems to track this, because they adapt based on transmit errors. With delay sensitive data like voice you have to be very conservative, so adapting up is much slower than down. 11n adds explicit per-packet feedback, recommending the transmission speed for the next packet. This is called Fast MCS (Modulation and Coding Scheme) Feedback. LDPC is a super duper Forward Error Correction mechanism. Although it is almost 50 years old, it is the most effective error correcting code developed to date; it nears the theoretical limit of efficiency. It was little used until recently because of its high compute requirement. An interesting by-product of its antiquity is that it is relatively free of patent issues. The term beam-forming conjures up images of a laser-like beam of radio waves pointing exactly at the client device, but it doesn’t really work like that. If you look at a fine-resolution map of signal intensity in a room covered by a Wi-Fi access point, it looks like the surface of a pond disturbed by a gust of wind – it is a patchwork of bumps and dips in signal intensity, some as small as a few cubic inches in volume. Transmit beam-forming adjusts the phase and transmit power at the various antennas to move one of the maxima of signal intensity to where the client device is. In a phone the chances are that there will only be one Wi-Fi antenna, so there will be only one spatial channel. Even so, the MIMO technique of STBC (Space-Time Block Coding) enables the handset to take advantage of the multiple antennas on the Access Point to improve range, both rate-at-range and limiting range. Incidentally, to receive 802.11n certification by the Wi-Fi Alliance, all devices must have two or more antennas except handsets which can optionally have a single antenna. Several considerations went into allowing this concession to handsets, mainly size and power constraints. STBC is particularly useful to handsets. It yields the robustness of MIMO without a second radio, which saves all the power the second radio would burn. This power saving is compounded with another: because of the greater rate-at-range the radio is on for less time while transmitting a given quantity of data. STBC is optional in 802.11n, though it should always be implemented for systems that support 802.11n handsets. Many of these features impose a considerable compute load. LDPC and STBC fall into this category. This is an issue for handsets, since computation costs battery life. Fortunately these features are amenable to hardware implementation. With dedicated hardware the computation happens rapidly and with little cost in power.